Spider Trap Reviews - How they work. 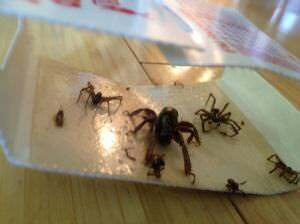 The Spider Traps sold by Cleaner Today are universal and can be used for a variety of spiders, brown recluse, hobo, black widow, common house spiders or any crawling insects (yes, even crickets and bettles). What our customers say about Spider Traps. This trap was located in the corner of the master bedroom behind the TV cabinet. I had forgotten about it. I have several traps around the house, but this had the most and the biggest so far. We just bought an older home and it was full of spiders. We found Catchmaster Spider Traps after looking at several other products. Most were full of chemicals.We prefer a non-toxic approach because of the children and our cats. The traps did a great job. I feel safer at night knowing that traps are on duty. I ordered some more for my parents. Thanks for a product that works! Discrete and these spider traps work! I bought these brown recluse traps for the office. Our office is attached to the warehouse, and we have had spiders / insects all over the place. Well these spider traps caught them! Anything that walked across the spider traps stayed in it. My co-workers didn't want to use sprays because we have to work inside the office, and several of us have allergies, so these spider traps were perfect because of the Non-poisonous, and No pesticide design. We'll keep ordering these brown recluse traps, please keep them in stock!